I recently read this article from the Wall Street Journal (please go read it!!!) discussing how children today have fewer chores, and fewer kids are even doing them at all. Really?!?! Wow. Talk about growing an entitled society. So, I’m taking a break from traditional recipe sharing for my Kids in the Kitchen segment, and spending today talking about how to bake a successful homemaker (of either gender). Let’s face it – no matter what their future careers, our daughters and sons are going to own homes (or rent them) and they’re going to have a kitchen. They are most likely going to have offspring that need to consume food, and if not, they themselves will need to know not only how to prepare that food, but how to get it to the table, and how to get it off of the table. Chores are not only a part of being in a family and “helping” or “being a helper”, but they are also part of LIFE – an important life skill that we MUST be teaching our kids! As soon as they can start helping to clean up, they should learn to pick up after themselves. Seriously, moms – WHY ARE YOU CLEANING ALL THE TOYS? Typically when we clean up a room, I size things up real quick and I pick one or two areas that I need Becca to clean up, while I do the rest. I don’t expect her to clean up an entire whirlwind of playthings. Not yet. However, I am starting to have her help clean up even when the entire mess was made by baby brother. Because that’s part of being in a family. We help each other. He’s not able to clean up his toys yet. So she can help him AND me by assisting in cleanup. 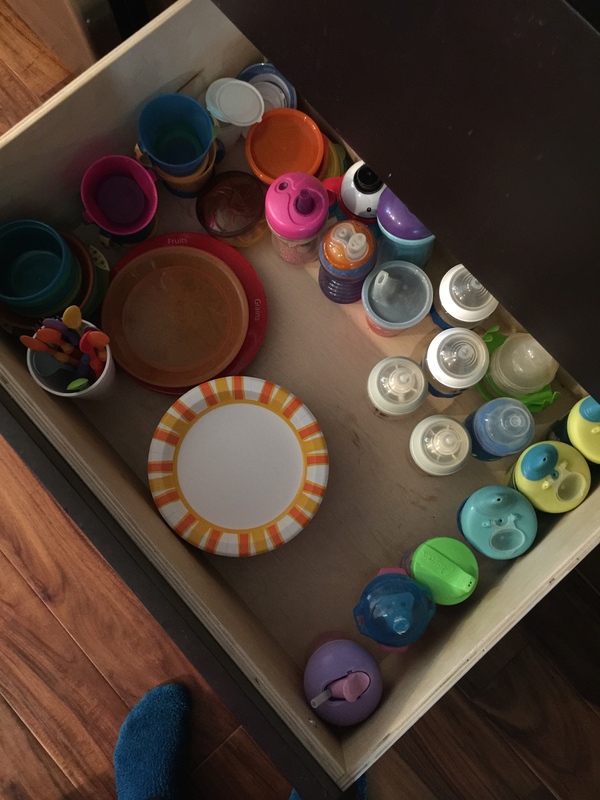 Here’s our kid drawer – with easy access for Becca to put items away, or get them out. I see her gaining confidence in the kitchen, and definitely taking ownership in the processes that she goes through to help. As the kids get older, and she can do more detailed tasks, Grayson will take over these more basic things. It’s very important that both females AND males have active roles in chores in all parts of the home. So if you think that chores are a thing of the past that you hated doing and don’t want your kids to have to “suffer” through, well, you’ve got another think coming. Let’s put it this way – if you don’t delegate some chores to your kids, not only will you have to do all of them for the rest of forever, you’re going to be raising kids who don’t know how to take care of their own basic life needs… and setting them up to FAIL – MISERABLY! 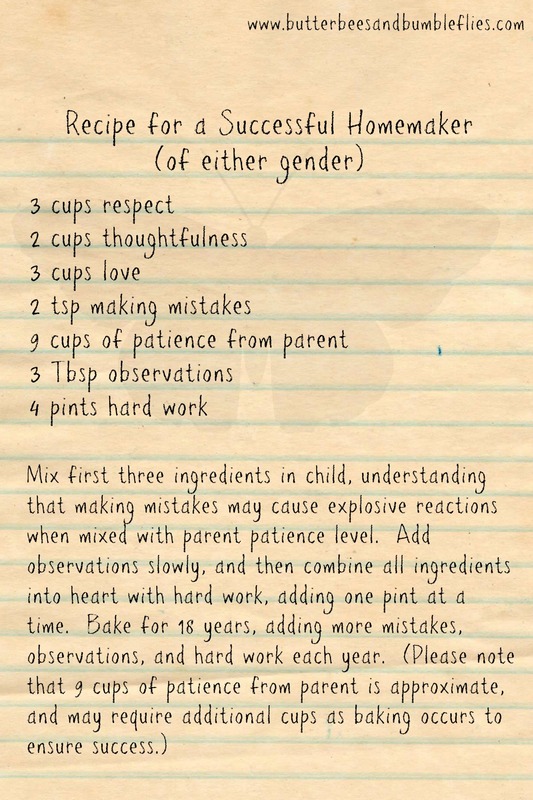 So – let’s ALL get our kids to be helpers in the kitchen! And please, don’t pay your 2 1/2 year old for helping. Part of being a member of a family is to help. He/She isn’t mowing the lawn for you so that you don’t have to, he/she is simply learning how to function as a member of a family. You don’t get paid cash for kitchen service – you get paid in life experience! Next Next post: Life’s What You Make It!